Martial Arts has so many benefits that parents are looking for. Parents also see very young kids on TV and featured in publications. So what is the right age to start? 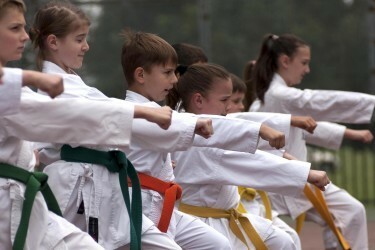 The age to start depends on the school, style of martial arts and the instructor, much more than the age of the child. I began teaching in the 1970’s and have maintained that the most important thing especially with a young child is that he had a positive experience. I have had kids come in to try my program because mom and dad see’s him jumping and kicking around the house and feel that he must have some talent. However once in a structured environment we find the child constantly needing to have a talking to or removed from the class. I then tell the parents that it’s just not going to be a positive experience for the child. Especially with preschool children who haven’t had any experience with group involvement. My recommendation is they wait 6 months and let’s try it again. Each child is different so take a trial program ad watch for yourself. Ages 3 to 4 years olds do well in a 30 minute class with a patient instructor. The classes should be fun for the kids and they should be doing some basic martial arts. Running and playing games is fun but most parents are looking to establish some self control and social skills along. Ages 5 – 6. This is a great age because these children have had a year or two of class environment at pre-school and kindergarten. Look for 30 minute classes with good protocol and established rules. Again fun is important but learning to be still, focused for minutes at a time, respectful, patient, along with kicking, balance and curriculum to memorize will have long term benefits in all aspects of lives. Ages 7 – 12. Seek out a school with young but mature instructors that kids can relate to. 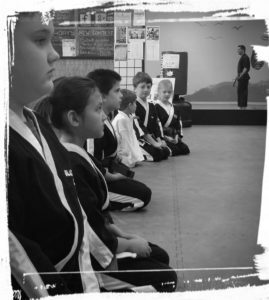 Martial Arts is a very visual endeavor and kids learn by moving, watching and working out with others. I recommend avoiding schools with very long classes. 45 minutes seems to be just right for this age group. Kids leave wanting more instead of feeling they can’t wait for the class to be over. Schools focus on different aspects and parents want to look for a school that fits their goals. Is it self defense, fitness or competition you are looking for? I also feel it’s important a school combines social events in addition to classes so kids make friends and enjoy some friendly competition. You are never too old to start! There is no upper age limit. Martial Arts is one of the few sports that kids and parents can enjoy together. Be a VIP or Very Involved Parent and lead by example by joining a martial arts school with your child. FREE Kids Workshops: Join us in Person!